Integral to the beauty and appeal of Clifton Terraces is, of course, its premier location. 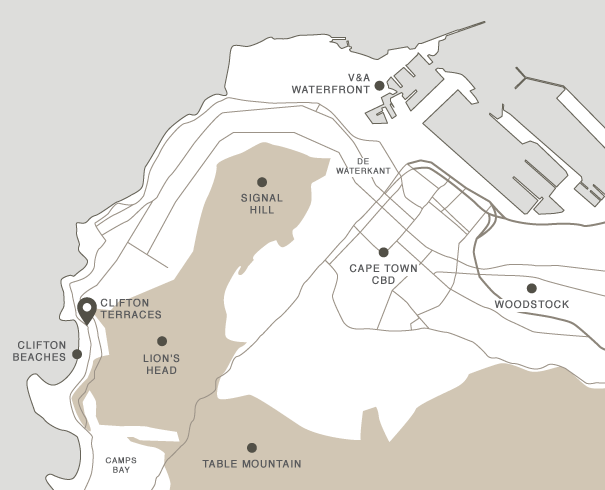 Nestled between Lion’s Head, Table Mountain, which is one of the eight natural wonders of the world, and Clifton’s pristine shores, Clifton Terraces is at the centre of the exclusive “Clifton Row”, one of the most sought-after residential reserves in Africa. Enfolded by poetic sunsets, glorious views, exclusive privacy and proximity to some of Cape Town’s hottest attractions, Clifton Terraces is the perfect embodiment of the Western Cape itself. For additional information on the stunning surrounds, select the dots found on the map. Known as the St. Tropez of Africa, Clifton's four beaches are popular with tourists and locals alike. Granite rock formations separate these four beautiful beaches from each other, while the bay shields them from the notorious South-Easterly wind. In the summer one will see beautiful yachts anchored off the coast, fund crowds of beach-goers, and a good number of surfers and water-sports fanatics. The winters offer a more serene and tranquil environment, where one could take peaceful sunset strolls on the beach after a long-day's work. Need we say more? Lion's Head, Signal Hill, and Table Mountain provide magnificent backdrops to the growing and cosmopolitan city of Cape Town. Table Mountain is one of the most well-known mountains in Africa, and being one of the New 7 Wonders of Nature, you and your visitors will find countless ways to enjoy your Clifton apartment's proximity to this breath-taking mountain range. Situated in South Africa's oldest working harbour, the V&A Waterfront has been a bustling mixed-use development ever since its inception. Its ever expanding shopping and leisure areas attract of 23 million visitors per year, and it is home to some of Cape Town's landmark hotels, luxury boutiques, and popular food and arts-and-crafts markets. The up-and-coming Silo District is the development's most recent addition, the architecturally inspiring Grain Silo will be home to the Zeitz Museum of Contemporary Art Africa. Woodstock is quickly becoming the Cape Town's up-and-coming neighborhood where young "techies" and hip creatives rub elbows in the neighborhood's shared working space, farmers' markets, art galleries, and popular restaurants. The main attractions in Woodstock are The Old Biscuit Mill, The Woodstock Exchange, The Goodman Gallery, The Palm's Market, The Potluck Club, and The Test Kitchen. Clifton is one of those rare places in the world where you can watch the sunrise over majestic mountains, take in the breathtaking views as the sun sets over the ocean, and enjoy the peaceful serenity of nature, all within a 10 minute drive from the city's bustling business district. Living in an apartment in Clifton will add that balance to life that no amount of luxury and technology can match.